Abby the Librarian: Grace Lin! Where the Mountain Meets the Moon is so different from your other novels. How was the writing process different for this book? In some ways, this book felt like a natural progression from my other novels. "The Year of the Dog" and "The Year of the Rat" helped build my confidence as a writer and it was with this book I felt self-assured enough to write something without the support of a true-life personal narrative. Before, research consisted of talking to my parents and relatives, comparably easy considering what I did for this book. This book needed much more research and consideration (which I talk about below). It was also really important for me for all the stories to tie together, because of the red thread theme-- was how everything is connected. So, this book was a very consuming process. I was constantly thinking of how to link stories-- writing not es on scrap pieces of paper at the gym, post it notes all over my house, notebook scrawls at lunch. This was the first book that I've written where it was impossible to work on anything else at the same time. Researching for this book was quite enjoyable! I traveled to China and Taiwan and relived my trip to Hong Kong as a way for me to soak up the landscape and help create the imagery in my mind. I also read and reread many Asian folktales and myths. Many times, I would read a myth that was little more than a line and would b e unable to find more - which lead me to create the story in my head. For example, at Chinese New Year, it is common to find pictures of two plump children dressed in red decorating doorways. These children are called Da-A-Fu. Why? I researched and only found a very short summary of them: they were two spirits transformed as children sent to destroy a green monster that was terrorizing a village. There were no details of how or why or what village, but it was enough to spark my imagination. So with that, I created the twin characters of A-Fu and Da-Fu in Where the Mountain Meets the Moon who destroy the Green Tiger. Even with the research, however, this book had its challenges. I am most definitely Asian-American, and probably more American than Asian. So capturing Chin ese authenticity was something I struggled with as well as debated internally. The book is very much tinged with my Asian-American sensibilities. For example, I knew and learned more about foot-binding for young girls in China; but I made the conscious decision to leave that tradition out of my book. I try to make a point in my author's note that the book is an Asian-inspired fantasy, not full of historical truths or even traditional Chinese values. I hope people still enjoy it as such. Well, when I first began writing this book, I had visited Hong Kong and Taiwan which were wonderful trips. Being Asian-American (and more American than Asian) it was a fascinating experience to be surrounded by a culture that was so foreign and familiar at the same time. Whenever I viewed the landscape, saw a temple or a sampan in the water, I suddenly would remember the Chinese folktales I had read as a child. I could see them happening in the setting around me and I knew in there was a book waiting to be written. I was almost 3/4th finished with the writing the book when I went to visit China. This was the perfect time to go, as I had an idea of what kinds of things I wanted to see and research there but the book was still open enough to be changed. And it was wonderful! Actually seeing China with my own eyes and experiencing it added such a rich layer to the story. 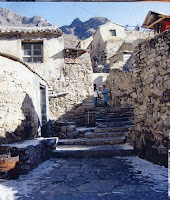 For example, one of the excursions we took especially for the book was a visit to a tiny mountain village. 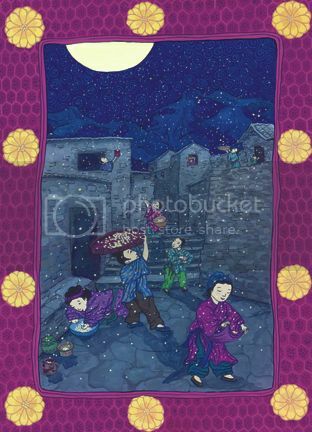 I wanted to see a mountain village because I knew Minli (the main character in “Where the Mountain Meets the Moon” ) would be visiting one. The whole time we were there, we were freezing cold but the villagers were so friendly and red-cheeked (which I was to find out later was wind-burn, not good circulation). So, those element of mountain cold and a warm, friendly shelter became the back drop of the village Minli visits. Too many! The ones I loved as a child and still love are the “Shoes” books by Noel Streatfeild (I think my favorite is “Family Shoes”), anything by Rumer Godden (I love “Miss Happiness and Miss Flower”), anything by Beverly Cleary (“Ramona and Her Father” still makes me feel warm and fuzzy), the Betsy-Tacy books by Maud Hart Lovelace, anything by Ruth Chew (“The Witch’s Buttons!”). I also LOVED “A Sundae With Judy” by Frieda Friedman (which was the absolute first MG book I read that had an Asian character in it), “A Search For Delicious” by Natalie Babbit, and, of course the Narnia Book and the Oz books. I am ashamed to say I am not as well read on recently published books (I’m the kind of person that can read the same book over and over again, and I tend to read my classic favorites!). But some of the more recent books that I love are “Masterpiece” by Elise Broach, “Alvin Ho” by Lenore Look, “Blow Out the Moon,” by Libby Koponen and “Fame and Glory in Freedom, Georgia” by Barbara O’Connor. Thanks so much for stopping by, Grace. I hope you had a great blog tour. It was a pleasure having you! Want to know more? Check out Grace's Facebook page and the Where the Mountain Meets the Moon book launch page. And, of course, visit your local bookstore or library and pick up Where the Mountain Meets the Moon! Friday, July 3rd: Right here! Lovely interview. Loved hearing about the origin of A-Fu and Da-Fu! Thanks so much for this great post! So happy to be featured on your blog, and that you liked the book.